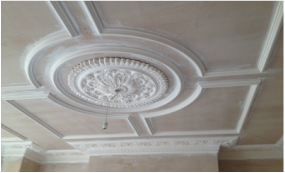 If you have a curved wall and you need a curved plaster cornice length made, whether to match an original coving or one of our own plaster cornice, we can make your choice of plaster cornice to the exact radius of your curved wall. Just send us a profile of the curved wall, and please note how many meters you require. To make a profile of your wall radius, you can use an appropriate sized piece of paper or card and cut to fit the shape of the curve.